The aim of this study was to determine the potential inhibitory effects of commercial diets on protease activities of Dentex dentex larvae and live foods. The highest and lowest protease ac-tivity of larvae was 387.08 ±0.23 U/mg protein and 54.66 ±0.15 U/mg protein, respectively. The highest and lowest protease activities of live foods were found in Artemia metanaupli (414.5 ±0.41 U/mg protein) and rotifer (156.25 ±0.09 U/mg protein), respectively. The signifi-cant differences between inhibition amounts of commercial diets on protease activities of lar-vae and live foods were found (p0.05). Also, the significant differences between the inhibi-tion percents were observed (p0.05). The highest inhibition percents of Caviar (200-300μ), Caviar (300-500μ) and copeod were found as 91.86 ±0.26%, 90.72 ±0.13% and 90.82 ±0.22% in enriched rotifers, respectively. In addition, the highest inhibition percents of Caviar (100-200μ) and Proton (200-400μ) were observed as 93.57 ±0.18% and 93.34 ±0.22% in the larvae on day 35, respectively. The effect of Caviar (200-300μ) on protease activities of rotifer was the lowest. In general, copepod had the lower inhibitory effect han those of other com-mercial diets on protease activities of larvae. Copepod showed the lowest effect on protease activity of larvae on day 30. The inhibition percents of commercial diets on protease activities of live foods were high except for rotifers. Our study revealed that the inhibitory effects of commercial diets used through weaning on protease activities of larvae and live foods should be taken into account. In conclusion, the potential inhibitory effects of commercial diets on protease activities of marine fish larvae and live foods to increase the survival and growth rates in hatcheries should be investigated in future studies. Recently, studies have been focused on the production of microdiets for weaning periods of marine larvae (Yufera et al., 1999; Yufera et al., 2000). It is known that weaning period has a critical importance for marine fish larvae. Cahu and Zambonino Infante (1994) indicated that the survival and growth of marine fish larvae fed solely on microdiet through weaning period are known to be very poor, but supplementation with live foods usually results in a marked improve-ment. To explain the success of live food over microdiets, some authors showed that fish larvae had insufficient digestive enzyme capacity for the digestion of exogenous food (Munilla- Moran et al., 1990; Kolkovski et al.,1993; Kolkovski et al.,1996). Additional studies in this regard need to define the factors that influence the better uti-lization of live food by fish larvae when com-pared to microdiets. Therefore, attention has been focused on the contribution of digestive enzymes from Artemia nauplii and rotifers commonly used in the feeding of marine fish larvae (Kurokawa et al., 1998; Garcia-Ortega et al., 1998; Garcia-Or-tega et al., 2000). Garcia-Ortega et al. (2000) showed that the contribution of digestive en-zymes from Artemia to the total digestion of food by the catfish larvae was less than 1% of the total amount of the proteolytic activity measured in the larval gut. Other studies carried out until now focused on the changes in the biochemical compositions and enzymatic activities observed through the differ-ent developmental stages and the different periods such as the enrichment and the starvation of live foods (Garcia-Ortega et al., 1998; Naz, 2008). In addition, the effects of feed ingredients used in the production of microdiets on protease activities of seabream larvae and shrimps were studied by some researchers (Alarcon et al., 1997; Alarcon et al., 1999). However, a study on the inhibitory effects of commercial diets on protease activities of Dentex dentex larvae and live foods is not available. 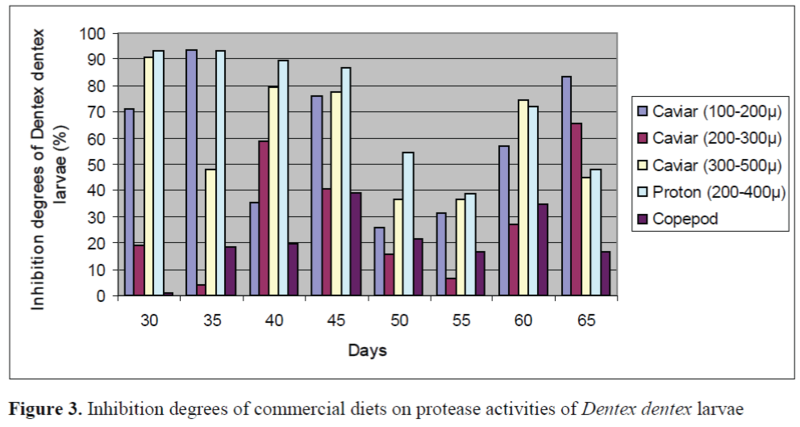 The aim of the study was to determine the potential inhibitory effects of commercial diets on protease activities of Dentex dentex larvae and live foods using in vitro techniques during weaning period. The study was carried out at the Hatcharies of Pınar Marine Ltd. Co., İzmir, Turkey. Water temperature was controlled by pipe heating sys-tems. Fertilized eggs of Dentex dentex were col-lected from the broodstock tanks and incubated in conical fiber glass tanks at a temperature of 18 ºC. Newly hatched larvae were transferred from the incubators to fiber glass rearing tanks with black walls and fed according to the commercial feeding procedure (initial stocking density; ap-proximately 100 larvae l-1). All experiments were carried out in triplicate. The rearing tank supplied with running sea water that had been filtered through a UV filter. Salinity was 35-38 g l-1 dur-ing the experiment. The oxygen levels were maintained above 6.5 mg l-1 with liquid oxygen systems. Air and fresh sea water were introduced into the bottoms of the tanks to prevent water stratification. Rotifers (Branchionus plicatilis) cultured on baker’s yeast (Saccharomyces cerevisae) were enriched with Selco. The average water temper-ature and salinity were 25ºC and 25 ppt, respec-tively. Samples for the protease activities and in-hibition assays were taken from rotifers and en-riched rotifers. Artemia cysts were incubated in filtered sea-water at 30 ºC under continuous aeration and il-lumination. After 24 h, Artemia nauplii were collected and then washed with tap water and then the enrichment with Selco was done. Sam-ples for the protease activities and inhibition as-says were taken from newly hatched nauplii and enriched nauplii. Dentex dentex larvae fed on commercial feeding procedure were sampled eight times, with 5-day interval between sampling, during the 35-day sampling period (from day 30 to day 65). Larvae were taken before the morning feeding and immediately stored in liquid nitrogen (-196ºC) to prevent protein autolysis. Live food samples were stored in the same procedure. Sam-ples were rinsed in distilled water after thawing and then extracts of larvae and live foods were prepared by homogenization of the whole larvae followed by centrifugation (16000 g, 30 min, 4ºC). Commercial diets used in this study were Caviar (100-200μ; 200-300μ; 300-500μ, BERNAQUA), Copepod (BERNAQUA) and Proton (200-400μ, INVE). Extracts of commer-cial diets prepared by homogenization (100 mg mL-1 in distilled water) followed by centrifuga-tion (15000 g, 10 min) were used in the analyses. Total protease activities of larvae and live foods were measured as described by Walter (1984), using casein (10 mg mL-1) in 50 mM Tris-HCl buffer at pH 8.5 as the substrate. The mixtures including extracts of larvae and live foods and substrate were incubated and then the reaction was stopped by addition of 500μl tri-chloroaceticacid (TCA) (120 g L-1). The absorb-ance was recorded at 280 nm. One unit of en-zyme activity was defined as 1 μg of tyrosine re-lease per minute. All measurements were carried out in triplicate. The soluble protein concentra-tions of larvae and live foods were determined according to Bradford (1976). The inhibitory effects of commercial diets on protease activities of larvae and live foods were determined by measuring the reduction in prote-ase activity of extracts using a modification of the method described by Garcia-Carreno (1996). The method is based on the measurement of re-sidual protease activity remaining after preincu-bation with different commercial diets such as Caviar, Copepod and Proton. Results are given as mean± standard error (SE). Comparisons were made using a one-way analysis of variance (ANOVA) test, and differ-ences were considered significant at the p<0.05 level. SPSS statistical software was used for sta-tistical analyses (SPSS, 1993). The changes observed in protease activities of larvae and live foods are given in Figure 1 and Figure 2, respectively. The highest and lowest protease activity of larvae was 387.08 ±0.23 U/mg protein and 54.66±0.15 U/mg protein, re-spectively. The highest and lowest protease activities of live foods were found in Artemia metanaupli (414.5 ±0.41 U/mg protein) and rotifer (156.25 ±0.09 U/mg protein), respectively. 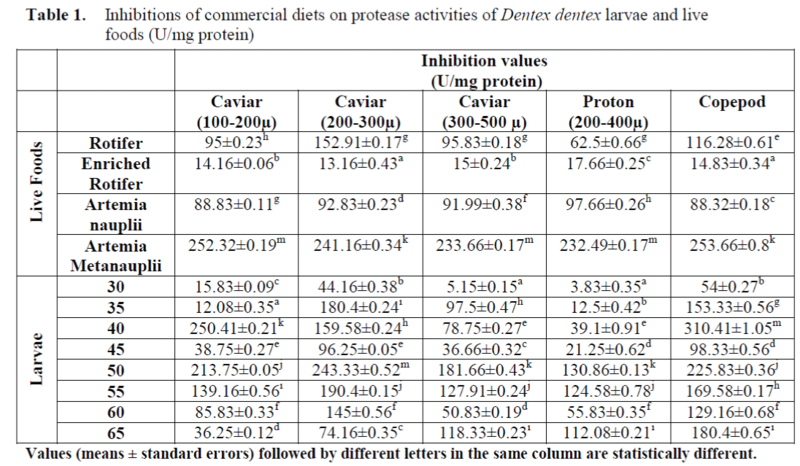 The inhibitory effects of commercial diets on protease activities of larvae and live foods are shown in Table 1. The significant differences between inhibition amounts of commercial diets on protease activities of larvae and live foods were found (p<0.05). The inhibition percents of commercial diets on protease activities of larvae and live foods are given in Figure 3 and Figure 4, respectively. The significant differences between the inhibition percents were observed (p<0.05). The highest inhibition percents of Caviar (200-300μ), Caviar (300-500μ) and copepod were found as 91.86 ±0.26%, 90.72 ±0.13% and 90.82 ±0.22% in en-riched rotifers, respectively. In addition, the highest inhibition percents of Caviar (100-200μ) and Proton (200-400μ) were observed as 93.57 ±0.18% and 93.34 ±0.22% in the larvae on day 35, respectively. The effect of Caviar (200-300μ) on protease activities of rotifer was the lowest. In general, copepod had the lower inhibitory effect than those of other commercial diets on protease activities of larvae. Copepod showed the lowest effect on protease activity of larvae on day 30. The inhibition percents of commercial diets on protease activities of live foods were high except for rotifers. The aim of the present study was to determine the potential inhibitory effects of commercial di-ets on protease activities of Dentex dentex larvae and live foods used commonly in the feeding of marine fish larvae. The fluctuations in the prote-ase activities of larvae through weaning period were observed. Protease activities of larvae tended to increase from day 30 to day 40 and de-creased after day 40. Zambonino Infante and Cahu (2001) indicated that the decline observed in specific activities of enzymes is not due to a diminution in enzyme synthesis but is the result of an increase in tissue proteins. The results found on protease activities of live foods showed that protease activity of Artemia metanauplii was higher than that of Artemia nauplii while rotifers and enriched rotifers had similar protease activi-ties. These differences may be the result of the developmental status. Our results revealed that commercial diets such as Proton (200-400μ), Caviar (100-200 μ) and Caviar (300-500 μ) caused a significant inhi-bition on protease activities of larvae and live foods. However, Caviar (200-300μ) and Copepod had the lower inhibition on protease activities of larvae. As reported by some researcher, the di-gestive performances of marine fish larvae fed solely on microdiets are known to be very poor (Cahu and Zambonino Infante, 1994). On the other hand, marine fishes appear to have high protease activities in the larval stages (Cahu and Zambonino Infante, 1994; Cahu and Zambonino Infante, 1995; Moyano et al., 1996). Some au-thors hypothesized based on the above findings that the limited utilization of microdiets may be related to partial inhibition of protease activities by some dietary factors. Alarcon et al. (1999) showed that ovalbumin significantly reduced (60%) the activity of proteases in 8-day-old sea bream larvae. Similar results were found when commercially produced microcapsules containing ovalbumin were tested using shrimp proteases (Alarcon et al., 1997). In present study, the inhibitory effects of commercial diets on protease activities of live foods were investigated. According to the results of the study, the inhibitory effects on protease activities of live foods except for rotifer were high. The inhibition percents of Caviar (200-300μ) and copepod on protease activities of roti-fers were lower than those of other live foods. Our results show that rotifers are the most suita-ble live food together with commercial diets such as Caviar (200-300μ) and copepod through weaning period. Cahu and Zambonino Infante (1994) indicated that although marine fish larvae fed solely on microdiets exhibite poor per-formance, but supplementation with live foods usually results in a marked improvement. In conclusion, the survival and growth of ma-rine fish larvae in hatcheries have been observed to be the low levels for larval stages. Our study revealed that low survival and growth rates may be related to the result of inhibitory effects of the commercial diets on protease activities of both Dentex dentex larvae and live foods. To increase the success through weaning period, the inhibi-tory effects of commercial diets used through weaning on protease activities of live foods should be taken into account. Rotifers and larvae had a good performance together with commer-cial diets such as Caviar (200-300μ) and Cope-pod. The present study provides information about the inhibitory effects of commercial diets on protease activities of larvae and live foods. When such data becomes available, they will serve the replacement of live foods with mi-crodiets. For this reason, the inhibitory effects of commercial diets on protease activities of marine fish larvae and live foods to increase the survival and growth rates in hatcheries should be investi-gated in future studies. Alarcon, F.J., Diaz, M., Moyano, F.J., (1997). Studies of digestive enzymes in characteri-zation and practical applications, Cahiers Options Méditerranéennes, 22: 113-121. SPSS, (1993). SPSS for Windows Base System User’s Guide,release 8.0.2, Chicago, USA. Walter, H.E., (1984). Proteinases: methods with hemoglobin, casein and azocoll as sub-strates, In: Methods of Enzymatic Analysis (Bergmeyer, H.J. ed. ), 5: 270-277. Zambonino Infante, J.L., Cahu, C.L., (2001). Ontogeny of the gastrointestinal tract of ma-rine fish larvae, Comparative Biochemistry and Physiology Part C, 130: 477-487.